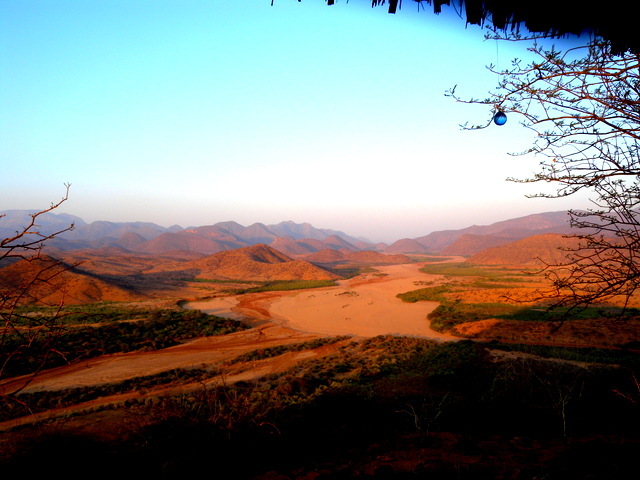 Elephants drinking at midday, the Magnificent Milgis lions roaring, and hunting dogs in our camp! 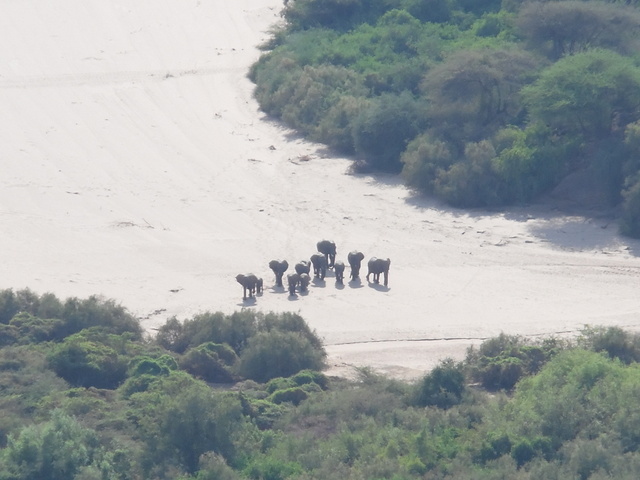 Elephants generally like to drink, wallow, play and have fun at midday but our Northern Elephants have not had that pleasure for nearly 40 years… I’ve been in the area for 30 of those 40 years and a week ago from our hill we saw a very exciting change!!!!.. This of course is our view from our hill.. Lkanto.. not bad !!! but day in, day out we watch and dream in hope that one day the elephants will be able to do as they like, when they like, how they like along with the people who live here.. Each of them on their own agenda with out disturbing each other! 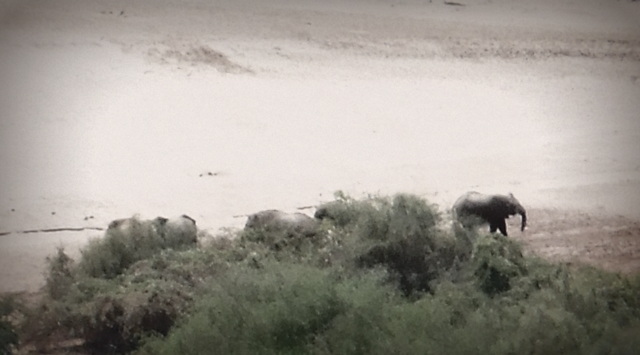 And BOOM out into our view a herd of elephants step out near midday with a purpose!?? They ambled out into the lugga, and we thought maybe they were running away from the people down the lugga who were watering their goats! 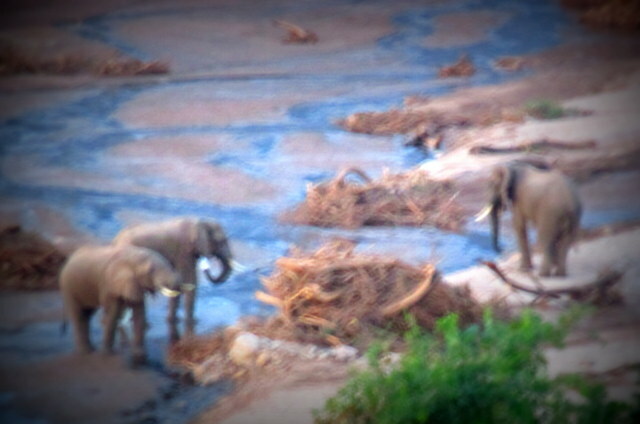 We thought they would cross and head into the thick bush below the hill.. but no they stopped for a looooong drink! 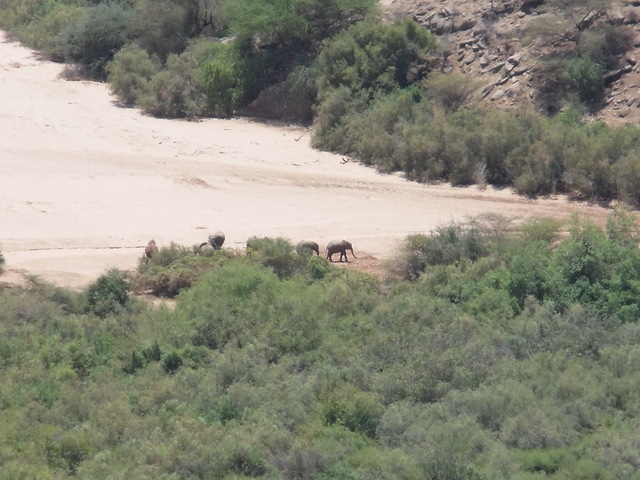 Unfortunately the trees are in the way but the whole herd mingled around enjoying digging, wallowing, and throwing sand around for nearly two hours!! my camera is not the greatest! BUT anyway it shows an ele! For a long time the herd dug for water played, frolicked and completly ignored the children who were making alot of noise in excitement of seeing them so close!!! midday drink.. so so very nice to see ! Quite a few yeas ago we made a film with the BBC part of the series ‘Human planet’ … “RIVERS” it was all about how wildlife and humans use each other to survive.. Our part was about some pastoralists coming from the Kaisut desert with their camels into an area they did not know and first problem.. Where to find water!? 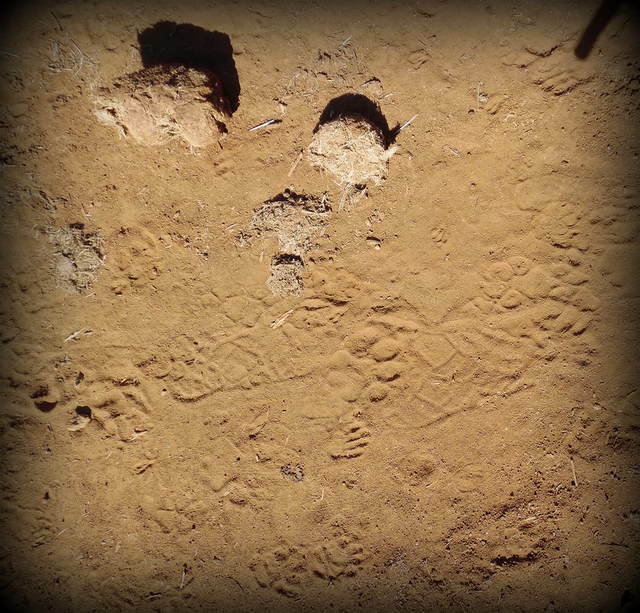 BUT when they saw elephant tracks in the sand of the Milgis lugga they knew all they needed to do was to follow the tracks and they would find water where the elephants had been digging! 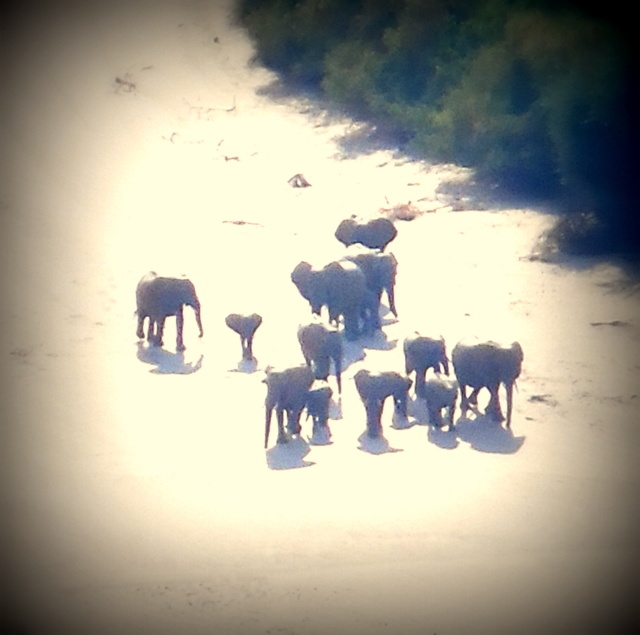 Getting the footage of elephants digging and drinking was quite interresting!! 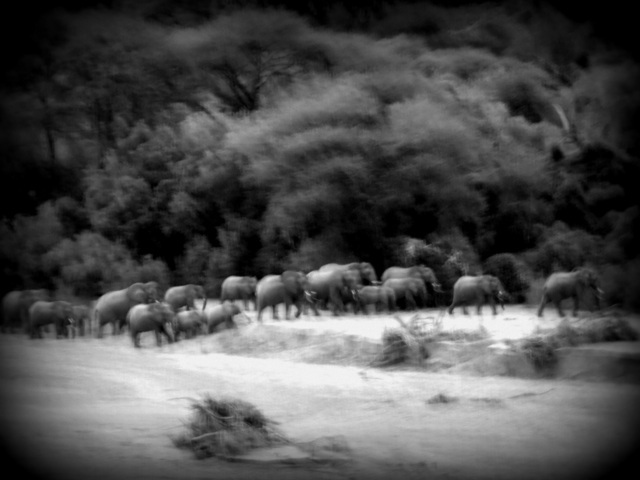 We spent 2 weeks filming elephants at night, with a night camera.. The results were fabulous and it was really fun for us to be involved in!.. 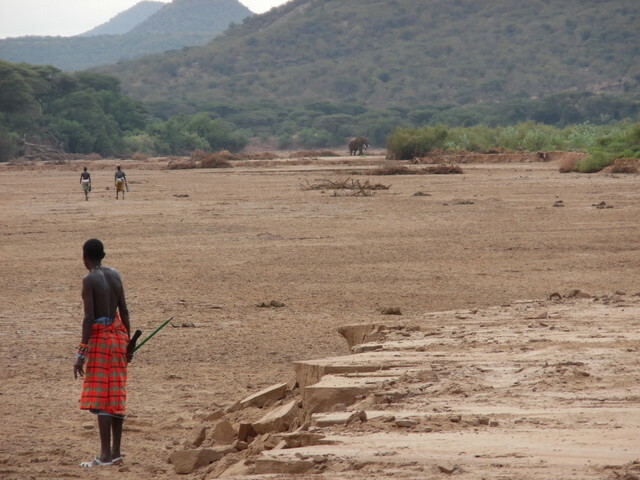 But really they prefer to arrive at water in the midday, as well as drinking they cool off .. Like in Samburu national park, where elephants know they are safe the elephants mostly come down to the river at midday.. now we have it on our front door! Never seen it here before! If we had known that they were going to spend so long drinking we would have gone down to take a photo but we never thought they would stay!! The herd were surrounded by livestock and noisy excited children!! you can see the camels in the for ground, then if you look hard there are about 6 children and several herds of goats to the left of the elephants, then up at the top of the photo, right corner, is a group of people watering their goats! Difficult to see but believe me! its so vast this country! STEP BY STEP we are winning!! The next day we walked down to where they had been drinking! 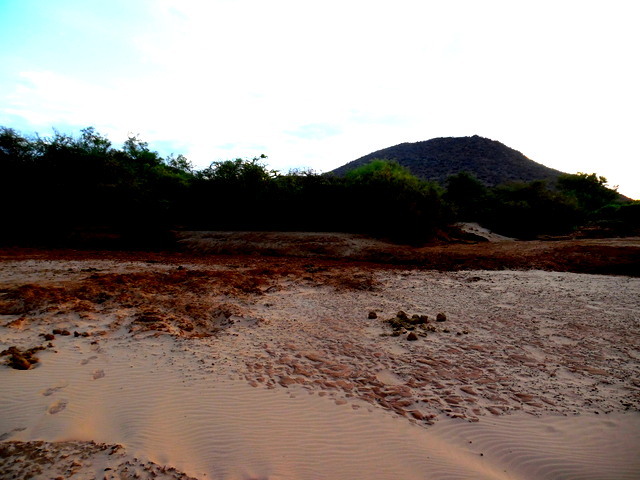 .. We were on top of the hill behind..
lkanto hill where we live towers over the beginning of the Milgis Lugga..
An Elephant drinking hole.. they dig diligently and carefully down into the sand with their trunk and throw the water and sand out, then patiently wait for the water to seep through! What is lovely is to see all the other animals that drink from the elephant hole! In the same week we had 2 wild dogs right in our camp, and I was incredibly lucky to watch a lion calmly wonder past one evening!! proof below! again lions, the famous Milgis lions were almost totally wiped out, but now they are making an amazing come back, and MOST NIGHTS WE HEAR THEM CALLING!! that same evening I had the pleasure of watching a lion walking from left to right of my view, a magnificent male.. even that is a first!! look at all the different tracks using the same path!! 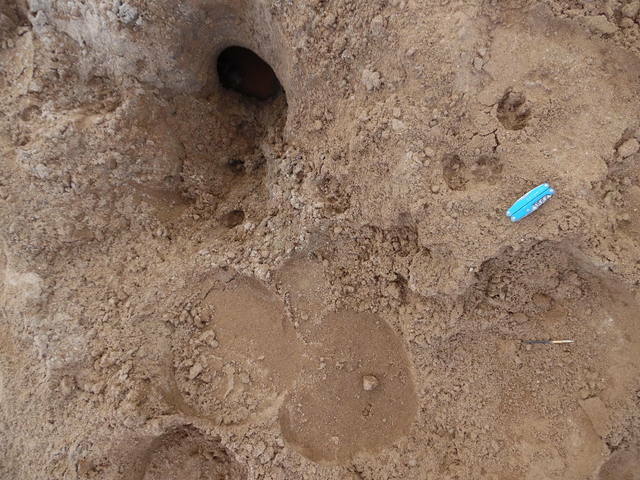 Elephants, people, baboons, vervets, porcupine, hyena, caracal, leopard and dog..
For years and years i NEVER saw a hyena in the day, but always saw tracks only.. But more and more we see them in the evening and morning!! 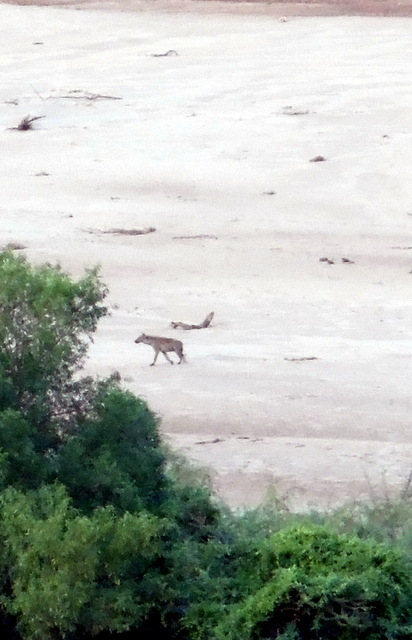 Hyenas are showing themselves in the day time! Out on safari lately, many lovely encounters with wildlife.. Incredible when you think that many a person told me when i first went to the the Milgis lugga that’ it was a lost cause.. the wildlife will never come back’.. I would like to say that A HUGE AMOUNT OF CREDIT GOES TO THE LONG SUFFERING COMMUNITIES.. who have lost livestock to these carnivores, but they also realise that with out wildlife, life is NOT THE SAME!! they need lion skin for their ceremonies as well!.. another crossing, midday.. this Elephant, with out looking left or right, just sauntered out in front of the whole camel team, not a worry in his life! And below our camp one evening! heading off to water on the corner, not perterbbed by our presence.. lots of camels and people on our bank!! 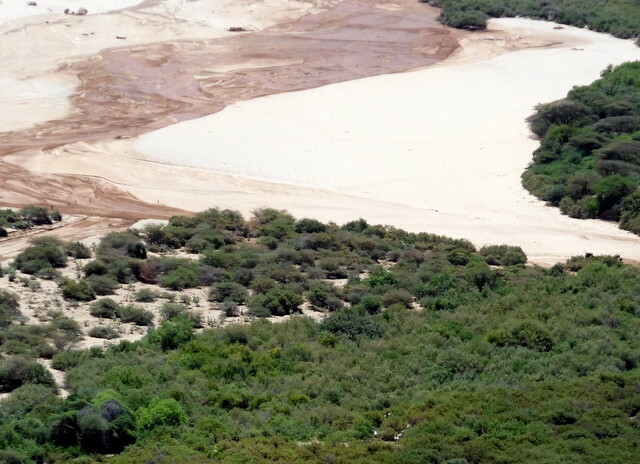 I was looking up some of my blogs from 2008/9 and this is what I wrote wrote.. ‘the ‘Milgis’ will know its making head way when we see elephants return to Mt Nyiru” … In the last 5/6 years a few have been going up there, probing, checking it out, spending a few days here and there, but coming back fast into the safety of the Ndotos and the Milgis Lugga, BUT we now have a small herd of 10, with youngsters that has settled there, are calm and are happily feeding.. when i was writing those even they hadn’t settled in the Ndotos, now its home!! picture taken by Heather Gibson.. Its like a painting! 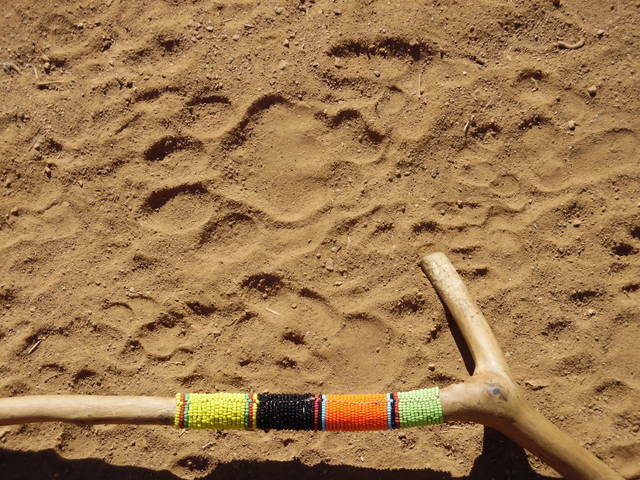 This entry was posted in adventure, Africa, carnivores, Conservation, Elephants, Kenya, Milgis, Northern Kenya, Samburu, Wildlife. Bookmark the permalink. « Lene Maria and Maria Annette.. In memory! It’s just great what you guys are doing! Showing what can be – thinking long term – no ‘quick fixes’ – all with the support and pride of the local community. 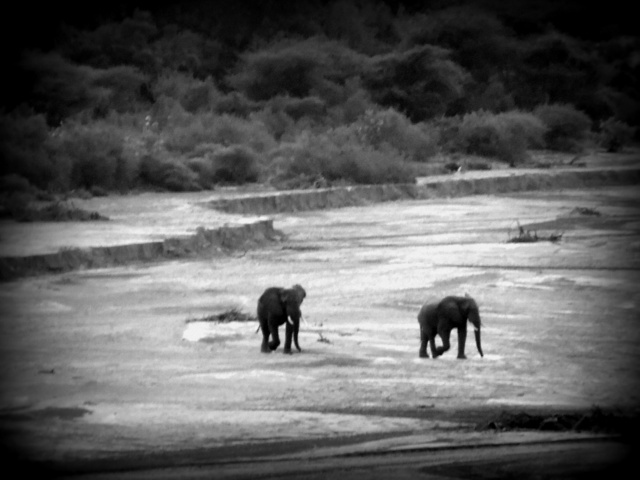 In the continental elephant conservation ‘picture’ the Milgis Trust and the results you are getting, give me hope. is it not nice to see all these animals. We are in the north again in some weeks but I don’t think we will have time enough to visit you again. Maybe another year.